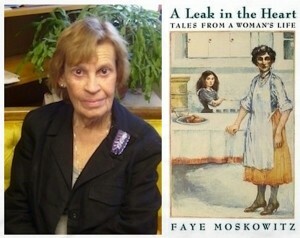 George Washington University’s Department of English and Jewish Literature Live proudly present a reading of Faye Moskowitz’s A Leak in the Heart, on Thursday, March 22nd from 7:00–8:30 PM in the Marvin Center Amphitheater (800 21st St NW). Born in 1930, Faye spent her early years in Detroit and Jackson, Michigan. There she worked for the Democratic Party until her husband’s job took the family to Washington. She enrolled at GW, earned her BA at age 40, and later a master’s degree. She taught middle school 12 years, then returned to GW to teach/direct the creative writing program. Eventually, she became chair of the English Department. She has taught Jewish Literature Live since its 2009 inception.